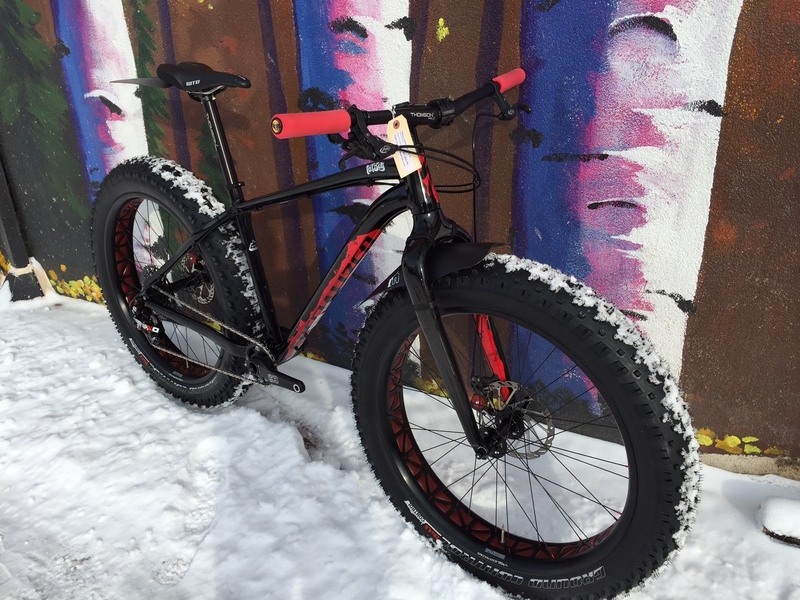 Fat bikes – they’re all the rage! While many consider fat bikes to be a trend, they are, in fact, here to stay! The hottest trend in the mountain biking world right now is the oversized bike that can accommodate tires up to 5 inches wide. Yet, as popular as they are, many have yet to experience this cycling bliss! Following are the top frequent asked questions we get at Peak Bicycle Shop in Golden, Colorado. Why should I ride a Fat bike? Fat bikes behave much like a mountain bike but, in many cases, they are much more versatile. You can practically ride them anywhere and they are particularly useful during winter rides in snowy conditions. They are also great beginner bikes and will make you feel like an 8 year-old again, bouncing gleefully all over the trails. How are fat bikes different than other mountain bikes? Many fat bike models today are similar to “normal” mountain bikes, which have slacker head tube angles, lower stand-over heights, thru axles, and tapered head tubes. The main difference is the tires. The wider ties have more traction in both dirt and snow. They climb better than almost any mountain bike and the fit tires provide greater cushion that feels like extra suspension. But what makes them special is they entice you to ride outside when it’s cold! According to the post, Fat Biking 101: 10 Things You Need to Know Before Biking in the Snow, most people do not ride when it is cold because, well, it’s cold. Fat bikes offer a unique experience and allow you to explore familiar trails in a new light. Fat biking lifts the winter doldrums by giving you a new freedom to ride off-road. In what kind of conditions can I ride my fat bike? Fat bikes can ride pretty much anywhere. They do really well on dirt but they are also very capable in the snow. Packed snow will feel very much like riding on dirt. Pushing through heaps of freshly fallen snow will provide more of a challenge and there will be some days when riding is simply impossible. Remember, while sliding around on ice may be fun, ice is ice. The bike will still go down if you are not careful riding on slippery substances. How do I stay warm on my fat bike in the winter? You have to think a little bit harder before and during your fat bike rides in the cold. Generally the most important tip for keeping warm is to layer, and to carry a pack to put your extra layers away. Some people prefer to wear ski goggles and a ski helmet, and lots of people wear winter boots. Poagies, insulated hand covers that slip over your handle bars, are also very useful for keeping your hands warm. Keeping your feet warm is key. Wearing arm boots, preferably water proof, with thick socks on flat pedals or clipless boots with multiple pairs of socks will help to keep your feet comfortable. How do I keep my water from freezing? Even though you might not feel the urge to drink as much when riding your fat bike in the cold, it is still important to drink fluids. There are a couple of tricks your water from freezing. During shorter rides, carry an insulated water bottle and start with really warm water. You can also add electrolytes or other ingredients to change the freezing point of the fluid, but may find limited success. When using a CamelBak or something similar, stick the bite valve in your jacket and blow out all the water in your hose. You can also buy neoprene insulators for the hydration hose to help keep water as a liquid substance. Should I use clipless or flat pedals on a fat bike? It’s your choice! The biggest problems people have making this decision is deciding how to best keep their feet warm. Having flat pedals will allow you to wear thick winter boots, which are more conducive to keeping your feet warm. However you can buy clipless boots that are designed to handle colder temperatures. Using a clipless pedal could prove annoying in snowy terrain if you have to dismount and remount frequently during your ride. What kind of tires should I use? How wide? What pressure do I run? Tube vs. Tubeless? You have to match tire pressure with conditions. Softer snow conditions: 6psi. Harder conditions: 8-10psi. (much lower than the normal bike). Fat-bike tires are typically marked as 26 x 4.0 though most are really more like 26 x 3.7 or 3.8. The actual size of the mounted tire will vary depending on the rim width used for the wheel. Many riders prefer tubeless because they reduce over a point of rotation weight and they provide better traction. What kind of fat bikes are on the market? The fat bike market has exploded in recent years. Brands include Specialized, Mongoose, Polaris, Kona, Gravity, Kawasaki, Borealis and more! Manufacturers are creating frames out of tons of different materials including aluminum, carbon, titanium, bamboo, real steel, and Wal-Mart steel. Most fat-bikes that you will come across have a fully rigid frame. However fat bikes with front fork suspension and full-body suspension have started to emerge. Finding the fat bike that works for you will depend on the type of riding that you do and, more importantly, your budget. However, at Peak Cycles Bicycle Shop, we are all big fans of the Specialized Fatboy Bike. We have found the Specialized Fatboy to be a highly rated, mid-range fat bike that is usable for a wide range of ages and skill-levels. In fact, the Fatboy was rated as the best mid-range fat bike in 2014 by Gear Patrol, a magazine that covers the best in gear, adventure, and design. Where can I ride my fat bike? Fat biking is abuzz in Colorado. Colorado is already a favorite state for cyclists due to the mountainous terrain, rugged trails, scenic views, and outdoorsy population. But now, Colorado is a hot destination for the fat bike phenomenon. There are also a ton of really fun fatbike events across the nation. Whew! Lots of questions but one final one. Are you feeling the urge to take on this fun fat bike phenomenon? Demo a fat bike at Peak Cycles Bicycle Shop in Golden, Colorado. Check out our fat bike bike selections, cycling apparel, hydration strategies, fat bike bike parts, and accessories. Plus, get even more of your questions answered in person!